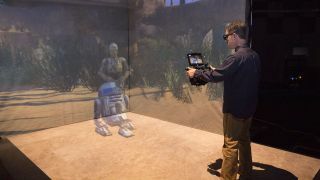 For those eagerly awaiting the first fully VR Star Wars movie, you will get a tiny glimpse into this experience ahead of Star Wars: The Force Awakens when ILMxLAB releases a serialized VR experience. Yes that's as cool as it sounds - ILMxLAB is the arm of Industrial Light and Magic that handles the AR and VR output, and it's going to be releasing a Google Cardboard-friendly offering as part of the deal with Google that launched this week. The new VR content is scheduled for December 2, and you can pick up a specially designed cardboard from a Verizon store in the U.S. to experience the, uh, experience. It's an early foray into a potentially thrilling new world of VR, and it will be the exciting fantasy worlds that we have created that are likely to be at the forefront of our virtual expansion. Star Wars is an obvious candidate from the movie world to lure us into a 3D simulated world, but a huge number of our favourite TV shows and games are also seeking to position themselves at the cutting edge.